Features evenseed technology that allows separate chambers to empty equally. Sure-lock cap system keeps squirrels out. Two independent seed compartments that can be filled with two different types of seed to attract a larger variety of birds. . . 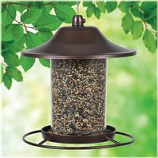 Attracts a variety of wild birds and offers a continuous supply of fresh seed. Red sparkle finish attracts more birds. Bird-friendly circular perch. Easy to clean and fill. .
All metal construction. Holds up to 2.8lb of mixed/sunflower seed. Drain holes. U-shaped perches. . Durable metal hanger. 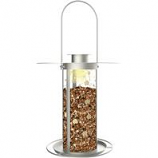 Holds up to 3lb of mixed/sunflower seed. Baffle protects from rain and squirrels. Ports slam shut with squirrel weight. .
Perch design allows birds to feed from multiple angles. 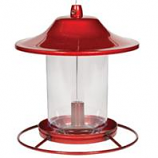 Patented sure-lock cap system helps keep squirrels out. Rustic brown finish. 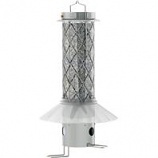 . .
• The Squirrel Dilemma Feeder Has A Wire Barrier That Protects The Feeder From Squirrel Damage. 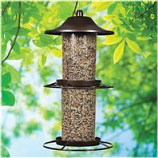 • The Evenseed Technology Is Like Three Feeders In One, Allowing More Types Of Birds To Feed On Different Kinds Of Seeds. 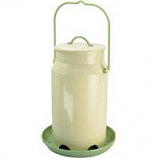 • Holds Up To 4 Pounds Of Seed. 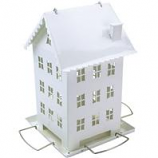 • Made From Vinyl Coated Wire and With A Zinc Die Cast Top and Bottom.